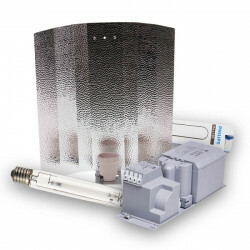 Our metal-halide lamps consist of a bulb, a hammered finish reflector and a ballast. 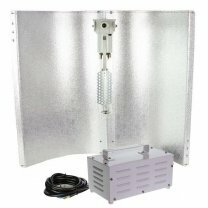 The ballast is not integrated into the lamp body on purpose, because then it can also be installed space-saving at other places. 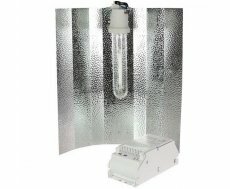 The illuminant for metal halide lamps are available from 150W up to 1000W, so that the growing phase can be supported optimally. During the flowering phase, the plant needs yellow-orange light. Sodium-vapor lamps generate cost-efficiently such light. 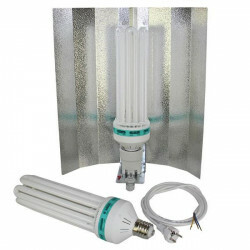 Here you can again choose between a complete lamp or a construction kit containing a sodium-vapor bulb, a reflector and a ballast. During the flowering phase you will need a strong lighting, therefore you should calculate with a 400W sodium-vapor lamp per square meter. Our best models generate a luminous flux of 130000 lumens and thereby assist you perfectly while your plants flourish. You want to illuminate your plants cost-efficient? Then our energy-saving lamps are the perfect choice. We offer you kits for the flowering and growing phase. 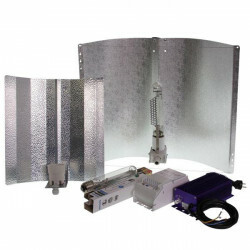 The sets contain a reflector and an energy-saving lamp and are easy to install. 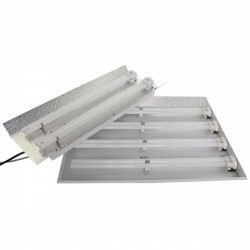 Some energy-saving lamps combine the color temperatures of flowering and growth phase, so that an exchange is not necessary. 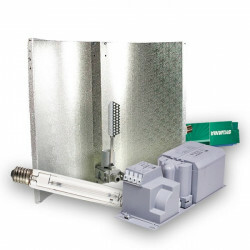 You need only a new sodium-vapor bulb or a metal halide reflector? Check out the lighting category.